A heavily modified Mercedes SLS AMG and a Jeep Grand Cherokee joined the half-mile drag race at the Magdeburg-Cochstedt Airport in Germany. By the way the video recorded at the race shows, we assume that the Jeep won. 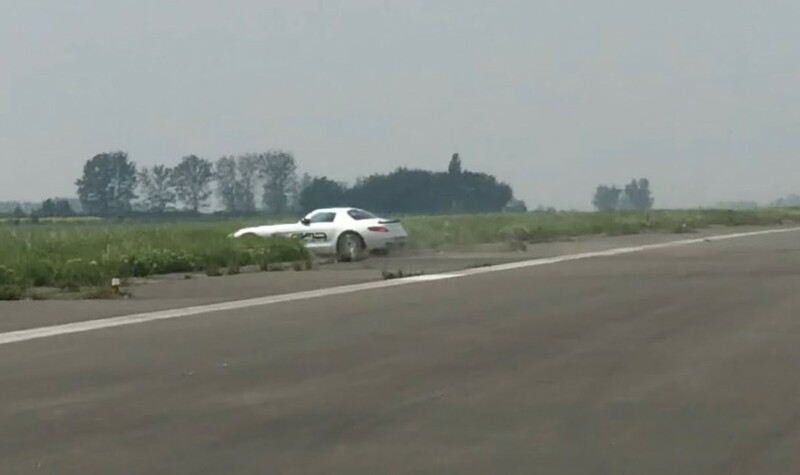 The drag race took a wrong turn – literally – for the Mercedes SLS AMG, just a few yards away from the start. The car left the tarmac and ended up in the grass. No word on the causes, but it might be a tyre problem after the driver accidentally slammed the brake pedal. The event was part of the RACE1000 and the SLS had joined the Klasse 2 competition, reserved for vehicles with outputs from 750 to 1,000 horsepower. Produced between 2010 and 2014 at the Sindelfingen plant in Germany, a standard SLS AMG makes use of a 6.2-liter engine that sends the 622-horsepower output to the rear axle via a 7-speed dual clutch transmission. The one involved in the jaw-dropping incident featured little over 900 horsepower.